How bigger can you go than advertising on skyscrapers? Wrap it and they will see it. It cannot be ignored. 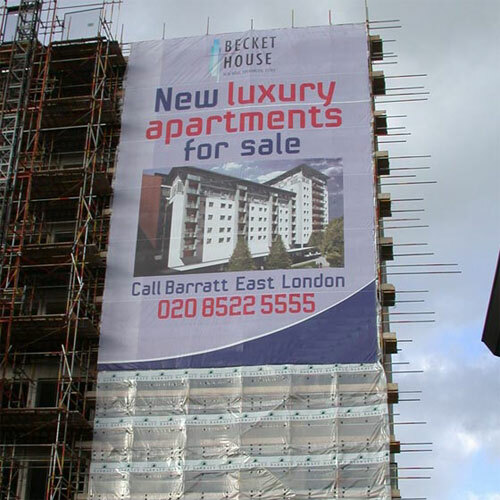 Call them building wraps, building graphics, or tall wraps, these vinyl pictures, hung together on a building, have created a new marketing option, as well as a new option for print revenue. They cost more than traditional signs, but if the adopters of these building-sized advertisements measure their effectiveness, they will likely find impressive results. There is not a way to properly describe a building wrap; it is best seen in person. The sheer impact a building wrap makes alone is extraordinary. 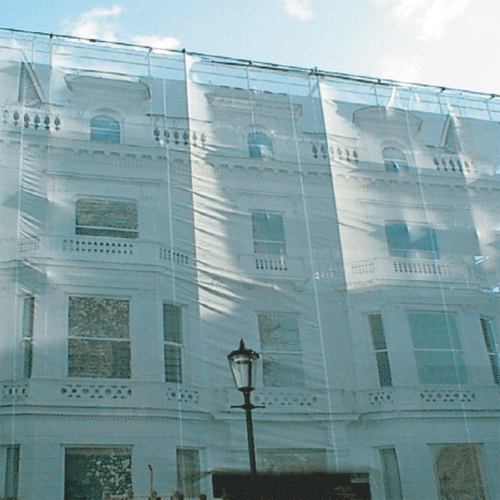 Building wraps do not need to cover the whole building, but many you will see cover a large part. These graphics, depending on the size and location may be seen for miles. People may think that a building wrap will look out of place, graphics rather than bricks, but artistically wrapped the results are amazing. Simple graphics also work in a less is more avenue of advertising. Striking letters and simplicity means that the viewer can glance at the image and know instantly what it is about. With advertising of this magnitude it is no wonder that the results are endless. Although proving expensive, tastefully wrapped buildings overthrow the initial costs by means of revenue made. 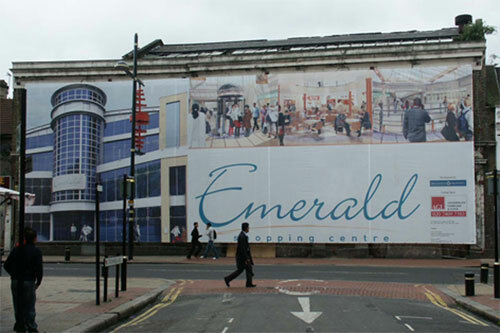 Building wraps are not always used for advertising, they can obscure building sites, buildings under-going work, sometimes including a sneak preview of what will be unveiled. 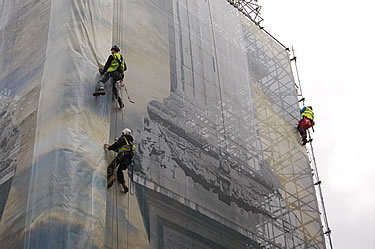 Some building wraps are even used while refurbishment of an older building is being undertaken, to make it a more pleasurable image for the viewer. One example of this was St. Paul’s Cathedral, London. Many tourists visit this site and while exterior refurbishment took place a print of the original building was made to wrap the building with. From afar the wrap mimicked the building so that convincing pictures could be taken, satisfying visitors. 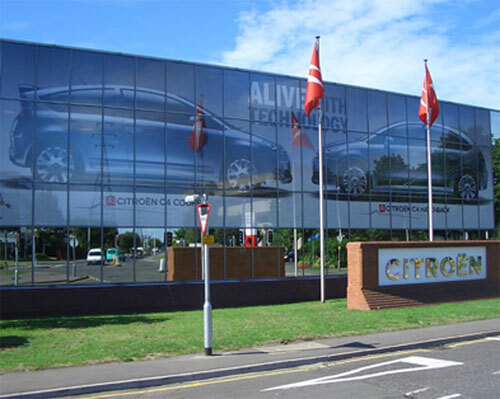 Modern technology allows us to produce, cost effectively, a whole range of advertising mediums, from a 10 metre high photograph on the side of a building to an image printed onto office carpet. 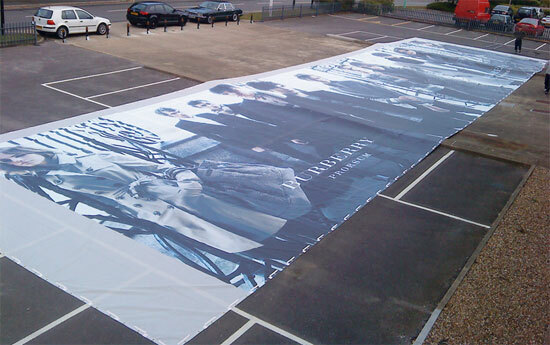 We can produce full colour prints on to many varieties of substrates up to 5 metres wide and can offer up to a 6 year outdoor guarantee.